Just a quick notice to those of you who have started editing and adding things to the brookfieldlodge.org website. Please make sure you are not overwriting any existing information and that you are giving files the proper filename, so that our index.html file can find it. If you are adding something new, then please inform myself so that the index file may be updated. Thank you. Today was one of these days when I can’t really tell whether it was boring or relaxing to do nothing at all. I really did completely nothing – not even the things I should have done. Well – I spent quite a long time in the basement probably annoying the people that wanted to cook in the kitchen, but entertaining myself with Eyals drums. Yesterday was a long day and it was pretty exhausting for me to get the plotting done in just the seven hours it took us to do so – for the director and especially members of the LX-Crew this has been the most boring day since a long time on the other hand. A few minutes ago I read the CV and brief history of one of our famous teachers at the Uni. Again, he might think this is the most brilliant piece of work the world has ever seen, whereas most people might have trouble reading this stuff at all… the ones under you who are also attending a course at this Uni know about whom I am writing there. 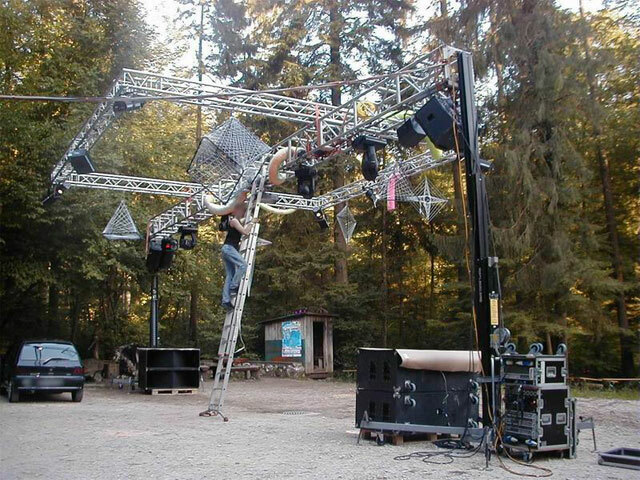 And last but absolutely not least coming back to our profession: Here is a photo of a open-air show-rig… again: You can be sure someone thought it would be great…. Food and not much else. This weekend has mostly consisted of eating what other people have cooked for me, which is actually really nice! Rene, Katta and Eyal made a splendid meal with dishes from all over the world yesterday, and today Ed and Steph cooked a really nice Sunday roast with all the things that go with it. And then Ed also made brownies, which I finished off with chocolate coating… always a winner! Now I’mÂ a bit lost. Have no projects on at the moment, with Unity finished and another 4 weeks until i’mÂ doing a show I suppose I will be spending even more time on the website.. perhaps even doing the tedious paperwork for H&S and my PPP evaluation. Contextual studies have begun, so that’s something to look forward to during the next few weeks. We’ll see what happens. Should you need an operator, please give me a call, it would be nice to do some buttonpushing again. As the weekend is drawing to an end with a really nice Sunday, so nice in fact, that me, Ed and Signhild went jogging in Sefton Park earlier today! I haven’t been jogging in a long time, but it was really good, and I even managed to keep up with the dancers! Me and Ed have made a deal to do this every Sunday, the weather permitting. The planned party on Friday turned in to a really nice evening with just three people comming around, we had a nice evening drinking wine, puzzling a jig saw that Mike bought for some reason (he needed the box for Memory of water I think… ) and just generally relaxing a bit after a few stressfull weeks. Yesterday we had our traditional Saturday dinner, with special guests in the form of two lovely ladies and our eminent production manager Didrik, as well as our new buidlings manager, Hendrik. The food was superb, from the first tuna/tomato starter that Hendrik made to Georg’s Bavarian â€œFaschingskÃ¼chleâ€. I must say that my fish wasn’t to bad either! We finished the night of with watching Kill Bill 1 while some got some nice massages from the lovely blonde one. And Ed as well. Today I have been doing some more work on the actual brookfieldlodge website that will be published soon. Have a look at www.brookfieldlodge.org/testsite and see what you think of the new layout idea. And check for technical issues, as I am still using the same technology, with the addition of frames. Makes it more convenient. Anyway, a really nice weekend! O.k well lets start with private wars and go from then, i had the technical rehearsal yesterday with hp, and it worked beautifully, it actually looks like a real show especially with the curtains up, I’m very excited and even more nervous. The trip down to London was boringly uneventful. i started writing the beginning of a play, something to do with flying. Lauren arrives tomorrow morning and we will be returning on Monday, enjoy story time with Neil Marcus. do send my love. its too early in the morning to think of anything else logical to say so i will save that to a later time. Memory of Water: Well, only three more days to go, before we start rigging stupid constructions in the Sennheiser. The set became even more complicated as in the first place and we will have a lot of “fun” I think. BUT finally, almost all of my lightbulbs arrived. Several calls with “Wendy” were neccessary but finally I got all of them together with the lampholders. The only thing I am still missing is the most important bulb – but it is on its way to the Brookfield Lodge as well. And guess what – all the lightbulbs turned out to be German products from the world-famous company OSRAM. Hmm, I hope this is a good sign … I haven’t got any spares and I hope they will like me for two weeks of usage in a row. WOW! Finaly, it is finished… weeks and weeks of work watching dance pieces and discussing choreography and design resulted in a very successfull show at the Unity Theatre here in Liverpool last night! Doing a complete dance show with 14 different pieces and 20 dancers and a lot of technology, with just two days get-in and tech time was quite an achievement I would say, but thanks to our great production manager and company manager, brookfield lodge’s own Mike, it all went nice and smoothly! Anyway, I’ll see you at Breaking Boundaries 2007!